Launched by the French scientific community, the definition of HyMeX has started with the drafting of a White Book released in 2007 identifying the main scientific challenges for HyMeX regarding the Mediterranean water cycle, and making suggestions on how to address them. 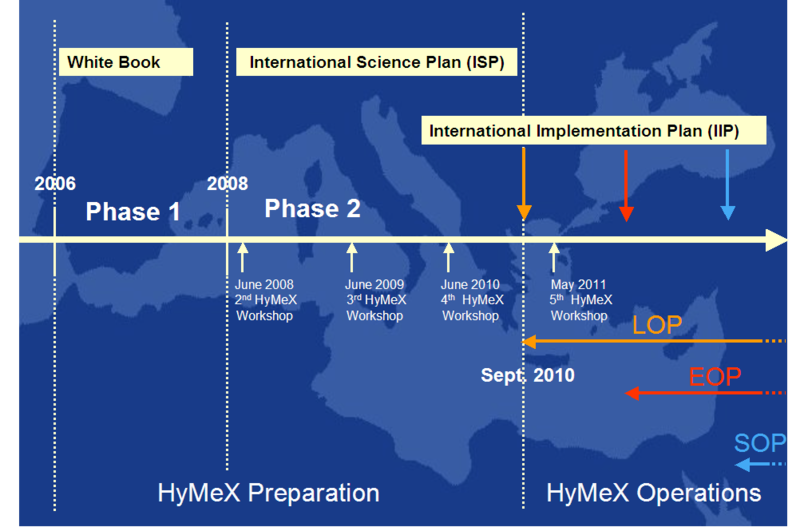 HyMeX has since extended to the international community, produced an International Science Plan (ISP), and is currently working at its International Implementation Plan (IIP). Since September 2010, HyMeX has entered its operational phase with the beginning of the Long-term Observation Period (LOP). 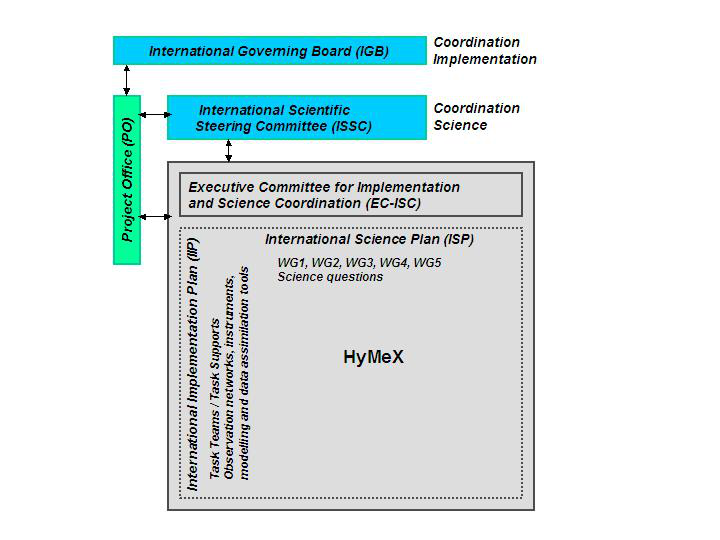 The International Scientific Steering Committee (ISSC) is responsible for the formulation of well defined and coherent scientific objectives and ensures the fulfilment of HyMeX objectives. The Executive Committee for Implementation and Science Coordination (EC-ISC) ensures consistency and communication between the cross-cutting activities lead in the WGs, TTs and TSs as well as the link with the ISSC. It is composed of WG leaders and TSs leaders for aircraft and ocean operations, major sites, and operation centers. Executive Committees at the national level coordinate HyMeX activities in participating countries. The management of the Project Office is under the responsibility of Veronique Ducrocq as chair of the Executive Committee. See also the section Contacts. Phase 1 of HyMeX (2006-2007) has been devoted to the drafting of the White Book (WB) which identifies the main scientific questions about the Mediterranean water cycle and the still open questions.